Erica Baum lives and works in New York. She has had solo exhibitions at Bureau, New York; Lüttgenmeijer, Berlin; and Circuit, Lausanne. Past group exhibitions include “Subject, Index,” at Malmö Konstmuseum, Sweden. Her work will be included in the upcoming group exhibition “Postscript: Writing after Conceptual Art,” at the Museum of Contemporary Art Denver, and the 2012 São Paulo Bienal. Her work was included in the book Vitamin Ph: New Perspectives in Photography, edited by T. J. Demos (Phaidon Press, 2006). Her artist’s books include Dog Ear (Ugly Duckling Presse, 2011), with essays by Kenneth Goldsmith and Beatrice Gross, Sightings (onestar press, 2011), and Bbabaubaumbaudevin (Regency Arts Press, 2012). Franklin Bruno is the author of The Accordion Repertoire (poetry; Edge Books, 2012) and Armed Forces (criticism; Continuum, 2006). He is currently working on a book about bridges, middle eights, and breakdowns in popular music for Wesleyan University Press. His most recent album with the Human Hearts, Another, was released by Shrimper Records in 2012. He lives in Jackson Heights, Queens. Corina Copp is the author of the poetry pamphlet Pro Magenta/Be Met (Ugly Duckling Presse 2011), and is currently working on the three-part performance The Whole Tragedy of the Inability to Love—based on the work of Marguerite Duras—the first installment of which was presented in this year’s PRELUDE Festival. Ariana Reines is the author of The Cow, Coeur de Lion, Mercury, and the play Telephone and the translator of books by TIQQUN, Jean-Luc Hennig, and Charles Baudelaire. Mónica de la Torre is the author of six books of poetry, including, most recently, The Happy End/All Welcome (Ugly Duckling Presse) and Feliz año nuevo, a volume of selected poetry translated into Spanish by Cristián Gómez (Luces de Gálibo). Born and raised in Mexico City, she translates poetry, writes about art, and is a contributing editor to BOMB Magazine. She teaches in the Literary Arts program at Brown University. R. H. Quaytman is a painter living in New York City. Over the last decade her practice has encompassed various roles, including artist, writer, and curator. 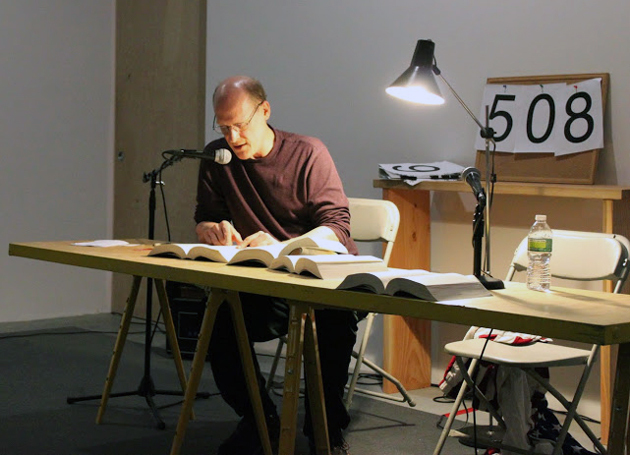 Recent projects include the artist book Spine published in 2011, directorship (from 2005 to 2008) of the New York gallery Orchard, a collective of artists, filmmakers, and art historians. In 2009 the artist’s first solo museum exhibition was mounted at the ICA Boston, and in November 2010 her first survey opened at the Neuberger Museum of Art in Purchase, New York and traveled in June 2011 to the Basel Kunsthalle. Quaytman has had solo exhibitions at Miguel Abreu Gallery, New York; Silberküppe, Berlin; Gladstone Gallery, Brussels; Daniel Buchholz, Cologne. Taylor Baldwin is an artist living in Richmond, Virginia, and a former Triple Canopy contributing editor. His work deals with life in the desert, the specter of imminent catastrophe, and the subtle touches of geology, primarily through sculptural installation, drawing, and video. William S. Smith is the editor of Art in America. He is a founding editor of Triple Canopy and, since 2017, an editor emeritus. October 20, 2012 3:30–5:00 p.m.
Jim Fletcher reading at The Making of Americans, January 22, 2012, 12:15 a.m.
Click below to listen to a recording of this event. Triple Canopy is pleased to present Automatic Reading, a seminar addressing the act of reading as a part of contemporary artistic practice. Open to the public, the seminar will bring together Erica Baum, Franklin Bruno, Corina Copp, Jim Fletcher, Ariana Reines, Mónica de la Torre, R. H. Quaytman, and others, whose work in visual art, writing, and performance is informed by the history of conceptual art. Participants will discuss how the legacy of conceptualism has challenged traditional notions of reading both as an exchange between an individual and text and as a public activation of the written word. Reading is frequently understood as a private encounter with characters, narratives, and, perhaps, an author. Reading in the context of conceptual art, in contrast, may underscore the material qualities of the codex (the page, binding, and technologies of printing) or cultural assumptions about readers and authors bound up with the physical format of the book. Rather than producing meaning, tout court, reading in a conceptual sense may become an encounter with an object, an audience, or social context—or with discourse itself. As in the case of unoriginal composition, the act of writing can be nearly indistinguishable from the act of looking over words. Conceptual reading establishes new uses for books and texts, even as it moves reading out of the realm of contemplation and into the space of action. Automatic Reading is part 2 of Corrected Slogans (A Publication in Four Acts), Triple Canopy’s ongoing collaboration with the Museum of Contemporary Art Denver, in conjunction with the exhibition “Postscript: Writing after Conceptual Art.” The first act of Corrected Slogans—Triple Canopy’s September 15th symposium, Poems for America—emphasized strategies of unoriginal writing and art making. Automatic Reading will extend this line of inquiry by focusing on how conceptual practices make use of conventions of reading. This seminar is open to the public. Seating is extremely limited; please arrive early.